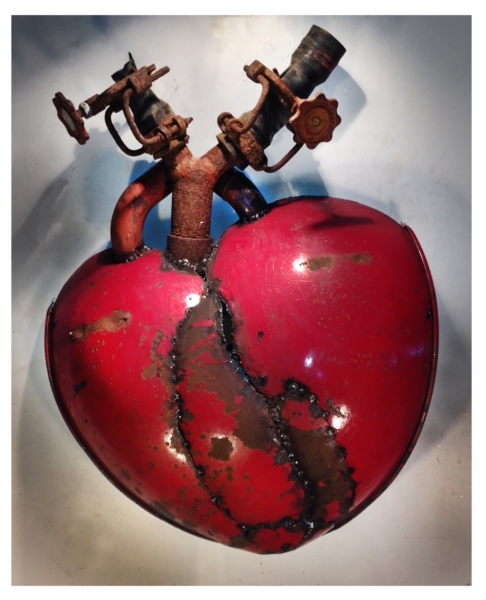 Mixed Media Heart themed sculptures and wall art. Since childhood I have enjoyed making and giving out Valentine’s Day cards. When I started attending art school in the later 1980’s, I decided to revive this childhood tradition as a form of pure expression untainted by the “Art World”. My creation of simply drawn, hand colored cards sent to female friends and relatives, morphed into elaborate collages I sent to a growing list of both male and female friends. I eventually began to create elaborate three dimension sculptures that I photographed and incorporated into postcards and then digital email blasts. 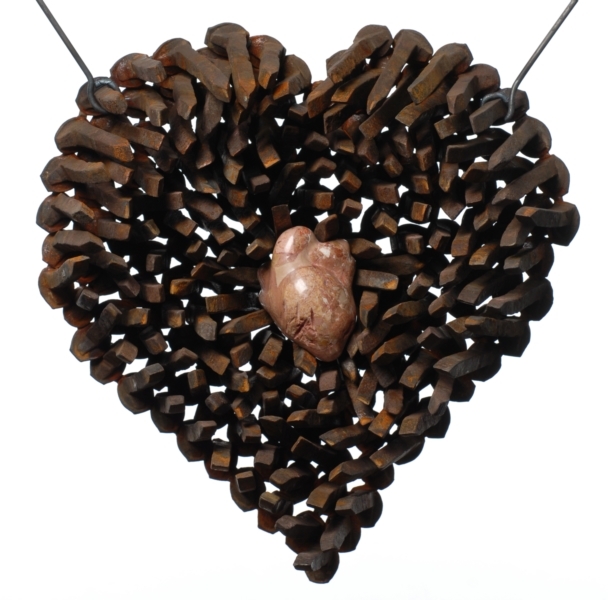 In this exhibition I am presenting a mini retrospective of heart-themed works in a variety of media both on and off the wall, as well as a number of brand new works that combine steel, stone, wood and found objects. I am also pleased to be exhibiting a recent ambitious lobby sculpture commission: Patience: Lady Bridgeport City Trust. 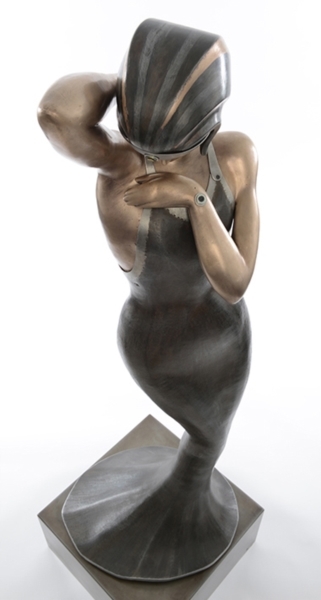 The sculpture is an Art Deco female figure hand fabricated from sheet bronze, steel and stainless steel. It was commissioned for the landmark Art Deco Building Bridgeport City Trust in Bridgeport, Ct. The sculpture is being moved to a new location in White Plains and while its new home is being constructed I have been given permission to exhibit it at Lagstein Gallery. Eric David Laxman- Curator for newly renovated Garden at the Edward Hopper House Museum and Study Center. The creative process is a mystery, known only to the artist. Or is it? Not always. reveal in rapid fire what inspires them via 10 slides at 20 seconds per slide. Sculptors Guild Group Exhibition celebrating the 80th anniversary of the Scuptors Guild. 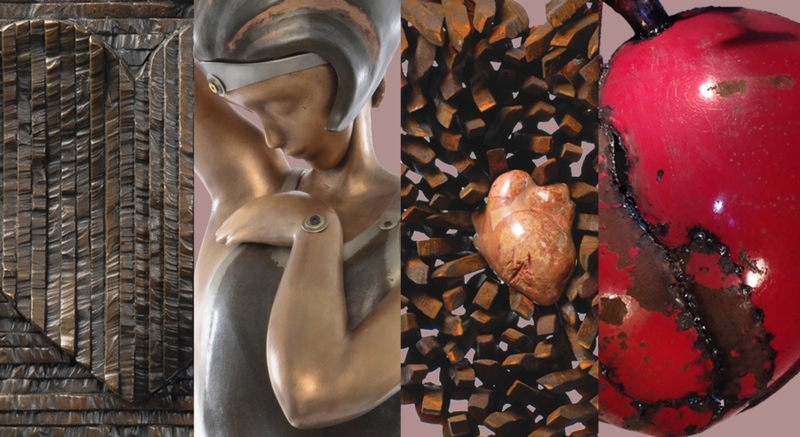 Mixed Media Sculpture and Wall Art, including a photo essay by Jayme Thornton. 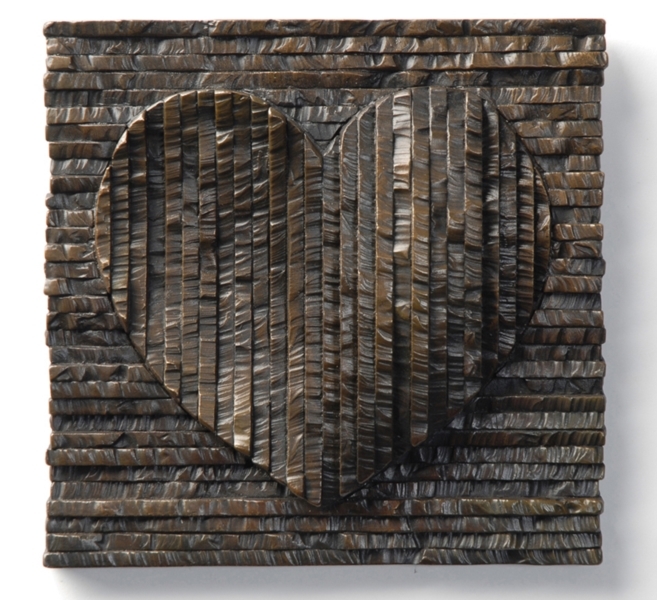 This solo show at the intimate setting of Lagstein Gallery features a combination of older works and recently completed sculptures in Stone, wood, metal and found objects, including photographic wall pieces with Laxman's characteristic found object frames. Eric David Laxman will be present at LAGSTEIN GALLERY throughout the weekend event. in a wide range of materials and styles. This kicks off the 80th Anniversary year of the Sculptors Guild.